In Society 5.0, new value can be generated in the following ways: through AI analysis of big data consisting of diverse information, such as meteorological data, crop-growth data, market conditions, and food trends and needs. 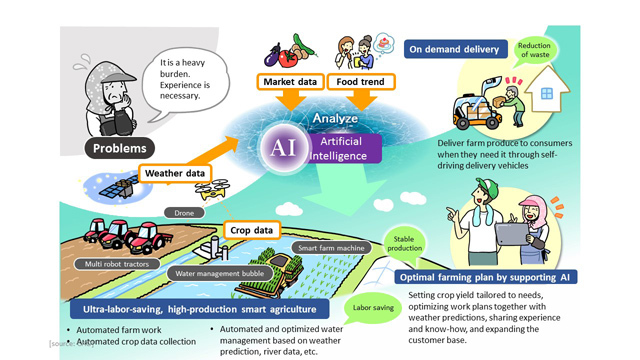 ・Achieve ultra-labor-saving and high-production “smart agriculture” by automating farm work and saving on labor through robot tractors, automating collection of crop data through drones, and automating and optimizing water management based on weather prediction, river data, etc. Furthermore, for society on the whole, these solutions can help increase food production and stabilize supply, solve the labor-shortage problem in agricultural regions, reduce food waste, and stimulate consumption.